I love a good monster story and this one definitely qualifies. A local legend about a winged beast that sounds part goat, part bat and a few other things makes the woods a spooky and desolate place, yet occasional campers and the odd person hiding a body brave the solitude of the trees. Some don't make it back. As monster stories go this was better than many, but it still lacked something. 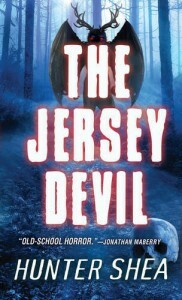 I think some more of the folklore on the Jersey Devil would have added to the feeling of horror. It was still a good story. Plenty of blood and gore and suspence about when they're going to attack, kind of like in The Birds.